For the last few years I’ve been buying herbs to plant in my herb bed to replace the ones that don’t make it through the winter, which, aside from chives and oregano that reseeds itself, means buying new thyme, rosemary, and a particular variety of dwarf culinary sage that I really like and have only been able to get from Richter’s near Aurora. The winters here just seem to be too harsh most of the time for these semi-hardy herbs to survive. They didn’t even make it through last winter, which was extremely mild by most accounts. 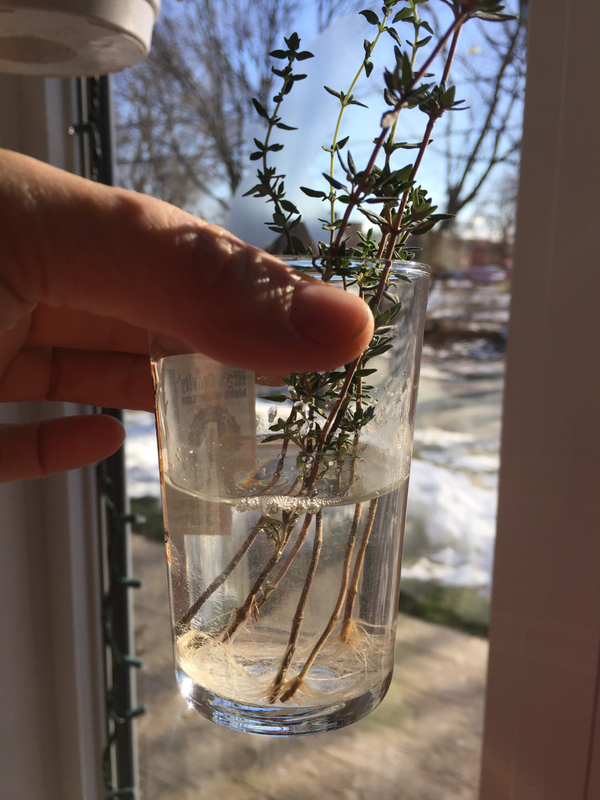 Making a trip to Aurora for (mostly) one single plant is kind of nutty, so I decided to try rooting cuttings of my herbs. I really didn’t know if it would work or not. Rooting cuttings can be done a few different ways. You can use a root stimulating powder (available at most garden centres) as I did, and put cuttings into a cup of water for a few weeks, or you can put them directly into the soil. Sometimes cuttings will develop roots without the stimulant but it depends on the type of plant. I decided to try a few cuttings placed directly in soil, as well as some just in a cup of water. The advantage of using water is you can see if its working. I was very pleasantly surprised to see the thyme and sage root extremely well. These water-rooted cuttings (pictured above) have developed very good root systems that I can now plant up in soil. Rosemary has been the tough one so far. Both the soil-rooted and the water-rooted version don’t seem to be developing much of a root system. 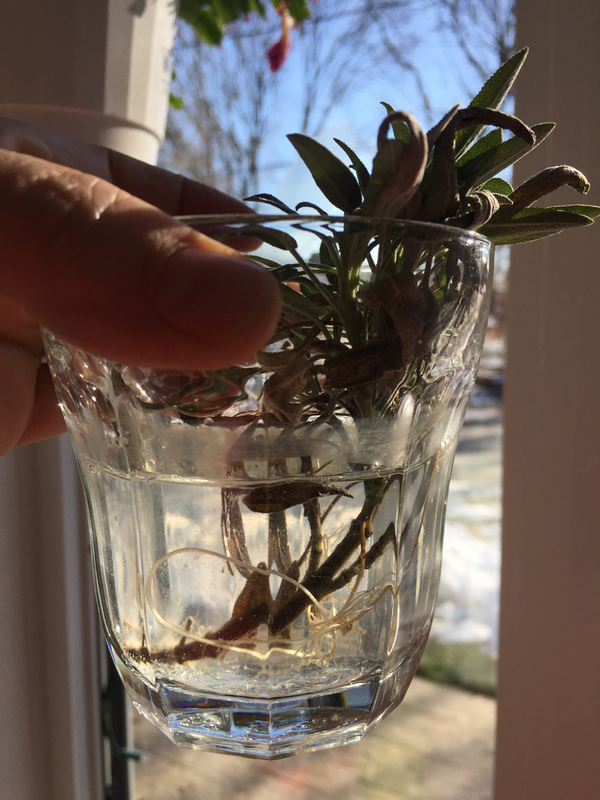 The rosemary in the soil isn’t completely dead but the leaves are droopy and a dehydrated. 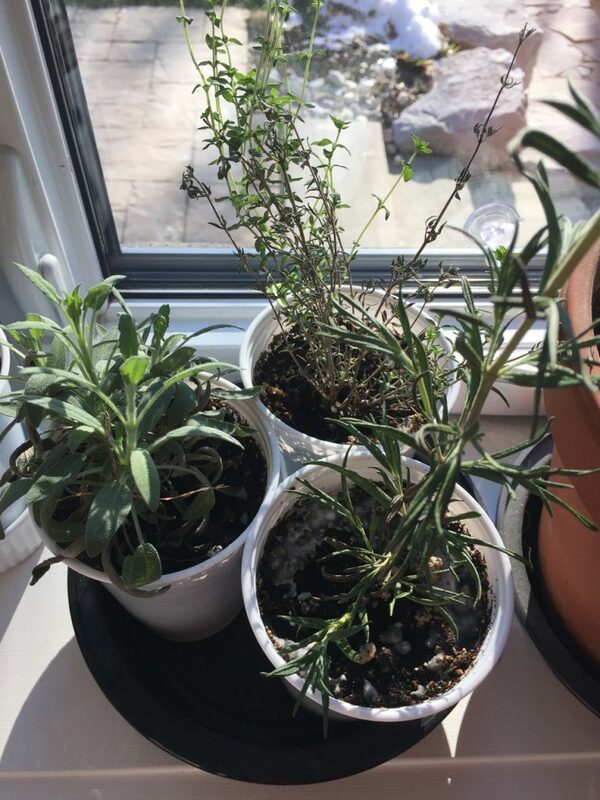 The thyme and sage both have new plant growth after being rooted in the soil. These cuttings have been in soil for about six weeks or so. The ones in the water were started later and are probably only about a month old. Since the main herb I was trying to save was really the sage, I count this a major success. I can buy rosemary plants for the garden just about anywhere, but not this super cute and tasty dwarf culinary sage. I’m pretty tickled to have come up with a method for overwintering it. Come spring, I’ll need to harden it off to go back outside and be replanted. 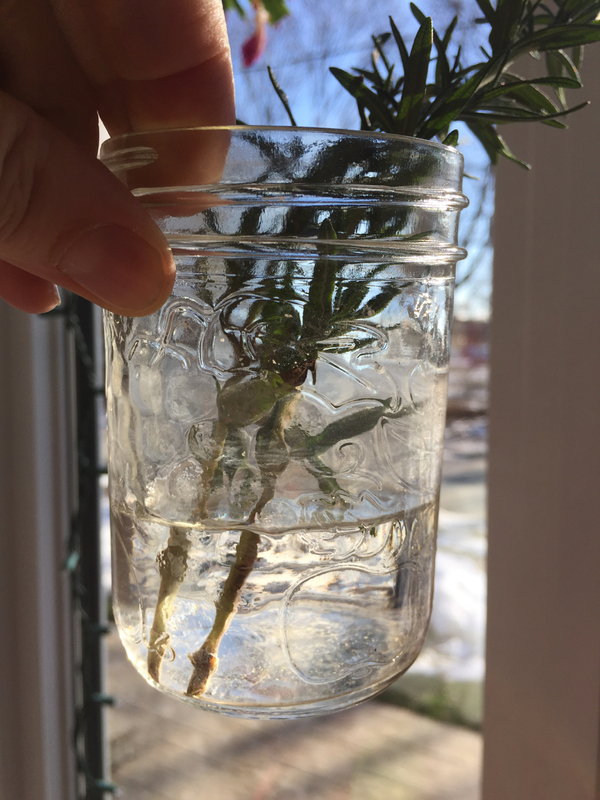 I’m not yet deterred by the rosemary’s lack of success; I’m sure there’s a way, because I’m almost certain this is how it’s being propagated in nurseries. From what I know, rosemary is kind of hard to get going from seed. In fact, I suspect most herbs we buy in garden centres are propagated from cuttings rather than seed. Anyway, happy overwintering my little herbs!